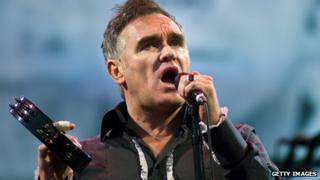 Singer Morrissey has revealed he has had four medical procedures he has described as "cancer-scrapings". Morrissey's representatives were not available to comment. The announcement comes after the star cancelled part of a US tour when he was treated in hospital for a respiratory infection in June. He also scrapped 22 US concerts last year due to ill health. His other recent ailments have included pneumonia, an ulcer, the throat condition Barrett's oesophagus and anaemia. The 55-year-old singer published his autobiography last year and is currently working on his debut novel. "I will be delighted to see it in print next year, and I might have no reason to sing again... which will make many people very happy!" he said. "I have reached the age where making music is meant to be over... as in finished with... so many classical composers were dead at 34. "So, I am still here, and nobody knows what to do with me, and a lot of people still want to listen to me." The star's next concert is scheduled for Madrid, Spain, on Thursday, and he is due to play 30 further concerts across Europe, finishing the tour in Greece in December. The only UK date of the tour will be at London's O2 Arena on 29 November.